N’Faly Kouyaté is a so-called Griot – a cultural ambassador from West Africa. As the son of the famous “Konkoba” Kabinet Kouyaté, he was traditionally brought up as a Griot and musician. In addition to various projects and solo performances, he also became a member of Peter Gabriel´s group Afro Celt Sound System and the Leader of his own band Dunyakan. In 1999, his projects achieved a Golden Record and in 1999 and 2001 they were even nominated for the Grammy Award. N’Faly Kouyaté’s dexterity and elegance in impassioned playing of the kora made him known as „Jimi Hendrix of the kora”. N’Faly Kouyaté was born into one of the the most famous families of griots of the heart of the Mandingue in West Africa, an area which includes Guinea-Conakry, Mali, the Gambia, Senegal, and Burkina Faso. As one of the most charismatic performers of his generation, N’Faly is ideally placed to carry on the legacy of his father and also to help promote knowledge, enjoyment, and respect for his culture.He is the son of Konkoba Kabinet Kouyaté of Siguiri, in the Republic of Guinea. Through his performances, he uses music and storytelling as a way to open doors between different peoples and cultures, striving always to tell about his culture while embracing others, with a profund sense of inclusion rather than exclusion, of unity between cultures and finally, our shared humanity. He is a tireless advocate of his culture, yet his love of collaboration and discovering new worlds leaves him open to all experiences. Comfortable in many worlds, he lives by his father’s early counsel to respect and embrace new ideas; this viewpoint is deeply embodied in both his recorded and live work. To this end, he has a nonprofit, Namunkanda (The Defense of Culture).He also pursues his career and goals through his work with his own ensemble Dunyakan ("The Voice of the World") in which blues, world music, jazz and the traditional music of Guinea are intermingled.From Africa to 2004: 1983-1996: Performed with the University Troupe of Conakry, Les Heritiers de Sory Kandia Kouyate, the Kaloum Saguee Theatrical Troup, the Bourkinabe Theatre Workshop and La Troupe Nationale de la Guinee (1st prize, Bouake, Cote D’Ivoire, ’94). He was also invited to perform with legendary Johnny Copland, in Burkino Faso.1996-1999: Upon arrival in Brussels worked with Jeunesses Musicale to educate children regarding the Mandingue culture. Formed the ensemble Dunyakan ("the Voice of the World"). They also formed Namunkanda ("the Defense of the Culture"), which strives to educate and encourage tolerance of all cultures through music. Released his first, self-titled, CD. Joined the Chris Joris Experience and performed on "Live at Middleheim," which won the "Prix Django D’Or" prize. Was invited to join the Afro Celt Sound System and performed on their second, Grammy-nominated CD, "Volume 2: Release," which acquired gold status in Ireland. With ACSS, toured Australia, Europe and the U.S. and performed with Peter Gabriel on the David Letterman Show and at WOMAD Seattle. Made extensive contributions to ACSS CD, "Volume Three: Further in Time," which received 2001 Grammy nomination. He toured US and Europe with ACSS in summer 2001. He performed for schools and cultural organizations in New York. Performed solo at the Taipei World Music Festival. He also continued Namunkanda, which expanded to North America. Dunyakan released their CD "N’Na Kandje," which received widespread praise. Dunyakan performed on national Belgium television on numerous occasions.2002-3: In January 2002, ACSS received the Listeners’ Choice Award at the BBC Radio 3 Music Awards. Dunyakan continued to perform throughout Europe, and toured the UK, performing at venues such as Blackheath Halls in London, Fiddlers Club in Bristol, and the Royal International Pavilion in Llangollen, Wales. N’Faly performed solo at the Big Big World Festival in Glasgow, as well as appearing on BBC Africa, HTV Bristol, and Choice FM. N’Faly and Muriel facilitate at percussion/polyphonic workshops throughout Europe. Festivals have included Bidasoafolk in the Basque Countries, and Rainbowpark, Netherlands. N’Faly also toured extensively with ACSS in Summer 2003 to promote their critically acclaimed new CD, "Seed;" they performed at Glastonbury, Cambridge Folk Festival, Eden Prject and Summerstage NYC, among others. 2003 also saw exciting new projects, such as "Anyeben kafo" (Malinke "we come together to play together"), organized by jazz musician Pierre Vaiana, and which combined 28 musicians from the Mandingue tradition such as Momo Wandel Soumah and Mamady Keita to meet and play with European musicians. N’Faly participated in "Coast to Coast. In 2003 Namunkanda invited by UNESCO to participate in their new LEA project and website, which helps educate about the arts on an international basis; N’Faly is listed on their site as expert in the arts and culture of the Mandingue region.2004: N’Faly performed with Muriel at the Musiques Sans Frontieres Festival in Cairo in April. 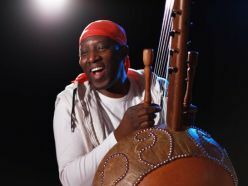 N’Faly also performed in Athens, Greece in June with a group of 42 Belgian-based musicians in conjunction with the 2004 Summer Olympic Games, in a series of concerts entitled "The World and Manos Hadjidakis." Dunyakan performed at WOMAD(UK) in July, as well as Festival Nuits D’Afriques in Montreal, their first North American appearance. Their CD, "Kora Grooves" was released internationally through ARC Music in September 2004.Recent Biography: N'faly's solo career has kicked into high gear since the end of 2003. He has toured Wales with Dunyakan, performing at the Royal International Pavilion at Llangollen among other venues. This experience energized Dunyakan and prepared them for marketing their CD, "Kora Grooves from West Africa," ARC Music, which was released in October 2004. In summer of 2004 N'faly and Dunyakan performed at the Festival Nuits D'Afrique in Montreal, Quebec, one of the most respected African festivals. They opened the festival and performed at Club Balattou with great gusto.With the release of the CD, a floodgate of sorts was opened, as the combination of international distribution, great review attention, and airplay of the music increased N'faly's international visibility greatly, setting him as an important international artist aside from his respected work with the Afrocelts. His passion to continue to build and develop his group and his own music is a continual process, and throughout 2004, Dunyakan continued to perform, at such respected festivals as WOMAD Reading (UK). In addition, one of his dreams, the founding of a music school which specializes in all manner of African music, was realized, and Cadence Mandingue(www.cadence-mandingue.be) was opened.2005 brought many excitements, as N'faly and Dunyakan continue to perform throughout Belgium, N'faly's current home (he lives in Brussels), and throughout Europe and the UK. In late May, summer season started with a small UK tour, ending at Bray Jazz Festival, and with stops at such clubs at Hebden Bridge's Trades Club, and the Junction, in Cambridge. They also performed at WOMADrid, WOMAD's first festival in Madrid, at Couleur Cafe, Francofolies at Spa, and, with the Afrocelts, N'faly performed at Eu'ritmix, at Grand Place in Brussels, one of the most beautiful sites in Europe. His song "Sene," or "Working the Land," will no doubt be the high point of the new Afrocelt release, Anatomic. N'faly performed at the Nuits Nomad, at Besançon, France. N'faly performed solo at Tartan Heart Festival in Inverness, Scotland, where he literally stopped traffic.Recently, N'faly has collaborated with the respected Belgian group Urban Trad, who put their own unique spin on the concept of fusion. He is featured on their new single, Diama Dén.In 2006, N’faly’s new CD, Tunya, which has many exciting and surprising new ideas and perhaps even a guest or two, is slated for 2007 release. He performed in September at Sori-WOMAD (S. Korea), throughout Europe at festivals such as Pardinas (Spain), Open Sky (Switzerland)... even home in Belgium at Afrolatino, Feest in’t Park, and Djansa Festival. On 29 April, he performed with the Afro Celt Sound System and Urban Trad, at Oxfam’s Melange Continental, their 35th year anniversary celebration. There were two trips to Malta, one to perform for the President. In September, the Bucarest Francophone in Romania, where Dunyakan shook the city! N’faly was also invited to guest with Urban Trad at Belgium’s anti-racism concerts on 1 October.2007 will see the release of his cd Tunya (Truth), which is an exciting fusion of African and Western, modern and yet the most ancient of Mandingue music, bringing the traditional Mandingue melodies and rhythms firmly into the 29th century, with his characteristic openness and inclusivity. It is a departure from many traditional African-based releases, with the collaboration of several classically trained artists, namely violinists and cellist, in addition to N'faly's tremendous kora and balafon playing and the more traditional sounds of the band as well, truly Mandingue music for the new millennium, authentically fusing ancient with modern. Discography: Cross Over the World. Tinder. 1995. (Kora, "Mariama"). Compilation.Planet Flanders. 1997. (Kora, vocal, "Telen"). Compilation.N’Faly Kouyaté. Dunyakan. Self published, 1996.Wes Welenga. Wes. Sony, 1996. (Background vocals).Myrrdin. Ars Celtica. 1997. (Kora)N’Toman Keita. N’Dania. 1997. (Kora, backing vocals).Alan Stivell. I Douar. Disques Dreyfus, 1998. (Kora).Chris Joris. Live at Middleheim. De Werf, 1998. (Kora).Afro Celt Sound System. Volume 2: Release. Realworld, 1999.Afro Celt Sound System. Volume 3: Further in Time. Realworld, 2001.N’faly Kouyaté and Dunyakan. N’Na Kandje. Namun Records, 2001.Afro Celt Sound System. Seed. Realworld, 2003..Jesse Cook. Nomad. Narada, 2003. (kora)Robert Plant. Sixty Six to Timbuktu. Atlantic, 2003. (kora)Afro Celt Sound System. Pod. Real World/Virgin, 2004.Kouyaté, N’faly. Kora Grooves from West Africa. ARC Music, 2004.Afro Celt Sound System. Anatomic. Realworld 2005.Urban Trad. Diama Dén (single). 2006.Tunya. N'faly Kouyaté and Dunyakan. 2007.